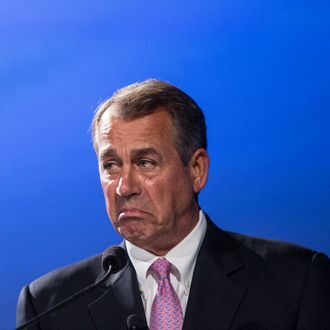 Speaker of the House John Boehner, who still has to get a lot done this month despite being a prime candidate for senioritis, announced that his colleagues will pick his replacement on October 29 — one day before he gets to hang up his garbage-man uniform forever. The new House speaker was originally going to be chosen this Thursday; the House Republican Conference will choose their nominee on October 8, but the whole legislative body won’t vote on the pick until the end of the month. Elections for the other leadership positions — majority leader and majority whip — will happen, if needed, at a later date chosen by the new speaker, since no one is even positive that those positions will be vacant at this point. “This new process will ensure House Republicans have a strong, unified team to lead our conference and focus on the American people’s priorities,” Boehner said in a statement. This new process will also ensure that the new speaker will learn about his upcoming responsibilities about a week before the federal government is scheduled to hit the debt limit. In other words, people who want to replace Boehner now have a lot more time to decide that winning such a thankless job isn’t that exciting. It still seems likely that Majority Leader Kevin McCarthy will become the next speaker — although the delay in the election gives potential conservative usurpers the chance to win supporters, or make everyone so mad that McCarthy’s chances of winning become even more certain. The winner will need at least 218 votes. Representative Jason Chaffetz announced this weekend that he planned to challenge McCarthy for the speakership. He told Politico today that his run for the position wasn’t just a publicity stunt: “I got plenty of ego but I also get plenty of publicity, so I don’t need anymore … This is not a blissful life — I take plenty of arrows … Go ahead and fire at me.” Conservative legislator Daniel Webster is also running a long-shot speaker bid. Majority Whip Steve Scalise — who is an expert at counting votes thanks to his job — said he had the votes to replace McCarthy as majority leader, should he get promoted. Budget Committee chair Tom Price has also signaled a desire to run for majority leader, should the position open up — and got a thumbs-up from Representative Paul Ryan.